just write: street by street. | The girl who loved to write about life. you find it isn't quite the same. have clearly come to end. as who you were when you were there. Oh man... this poem hits on everything for me. Beautifully written and really gets to the heart of this nostalgic feeling! Literally I just had a conversation with my friend at lunch today about this!! 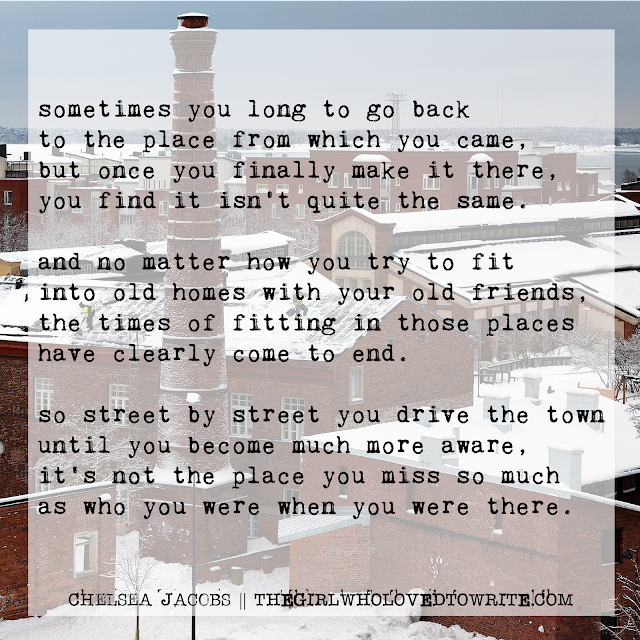 And the torn feeling of loving some place new, but missing the old place. Etc., etc. This is great. This is great! I tend to day dream about what I would do if I could go back ten years with the knowledge I have now. How would friendships be different? Social life? The first job? Dating? Loved this poem! ...and all the chills. Yes. I've been trying to articulate this for the past several months, and I've been failing to do so as eloquently. This time in our lives sure is a strange one. What in the world this is so powerful and I can related so much! Thank you! Beautiful. It is true even if we go home it is not the same, we will never look at it the same as our perspective has changed. I love this so much! So true and so beautifully written. I love this! And it's so true!